"In a climate such as this, expatriates are attracted to the returns offered by investment houses in Sri Lanka ranging from 15-20% on deposits. However, the government has made it extremely difficult for expatriates to invest in Sri Lanka due to the lack of clear cut policies and information that provides a level of comfort for those living abroad." (July 10, Colombo, Sri Lanka Guardian) With the world economy in turmoil, Sri Lanka is suffering the ripple effect of the oil price hikes that affect every aspect of life. On the one hand, the economy is drained by war. The lack of funds for infrastructure investment is also an outcome of corruption that continues unabated. The government appears to be focused on ending the war but is there any focus on what we plan do when the war ends? Rhetoric is one thing but at the end of the war, many will be left without a source of income and a large number of soldiers will have to be provided alternative occupations. The disabled need to be taken care of, and helped to enter into mainstream life as far as possible. All of the above require funds and we are not generating the kind of revenue needed. The government has failed to tap a large resource base - retiring expatriates who although enticed by high interest on investments in Sri Lanka, fight shy of the draconian conditions laid out for expatriates who wish to invest in Sri Lanka. We all live in hope of the promise that the war will end soon and that prosperity will return to the country. However, it is not adequate to live on hope and words. The government must have a vision for what they plan to do for the country. If the war ends, what happens next? How are the soldiers to be employed? What are the development projects in the pipeline? All the plans have to run concurrently. If we are so positive about winning the war, we must be positive about what we do when we win the war and have our wish list lined up. Of course, developing the country, generating income and preventing crime and corruption should be a priority on the agenda. We would like to see the pre 1983 growth and development that was so abruptly taken away from us. The pivotal years around 1983 that drove many disappointed people away from the country should now be turned around for developing the country. Rather than donate to the LTTE, the large expatriate population should be made to contribute to development. The professionals, who benefited from the free education system claimed discrimination, making that the excuse to donate for destruction. They should be the first to participate in the redevelopment of the country. Apart from this group, there are others who can be encouraged to invest in the country. It is surprising that we don’t have any plan in place to tap into that great resource base - retiring expatriates. We are now approaching the third or fourth generation of immigrants who have established themselves in developed countries. The baby boomer generation is now approaching retirement if not already retired. In relation to career and earning potential in this age range among expatriates, planning for retirement and the desire to return to their homeland plays a major role. The decision depends on the attitude of the government. Authorities in Sri Lanka may or may not be aware that today, in the United States of America, the return on investment for individuals range between 3% to 5% in secured low risk investments. This income is taxable and leaves an even lower return. The real estate market is in a slump. The Mortgage Bankers Association reports that every 3 months, 250,000 families enter into foreclosures due to their inability to meet monthly mortgage payments. It reports that more that 6 in 10 home owners are delinquent in their mortgage payments. Not only Sri Lankans, even foreigners will be interested in the high rate of return on investment in Sri Lanka if there is some flexibility offered for the benefit of the investor. Even considering inflation, if the tax is lowered to a reasonable rate, investors will come out on top. Costa Rica is advertising to attract US investors looking at more lucrative returns to invest in property in that country. 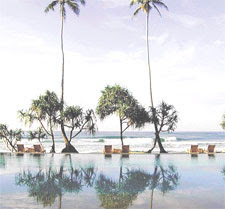 In a climate such as this, expatriates are attracted to the returns offered by investment houses in Sri Lanka ranging from 15-20% on deposits. However, the government has made it extremely difficult for expatriates to invest in Sri Lanka due to the lack of clear cut policies and information that provides a level of comfort for those living abroad. The fear that expatriates are subject to higher taxes and the requirement of a national identity card from those who left the shores as long ago as 25 years are all deterrents. Fear of being penalized for not having an NIC even though such NICs are so outdated that the individual cannot be recognized, keeps many away from investing. There is also the fear of having to pay an exorbitant fee for dual citizenship in order to have investments in Sri Lanka. These fears will naturally prevent a huge amount of resources from being channeled back to the country. If an expatriate is willing to invest US$100,000 in a fixed deposit that pays a modest 15% return at the conversion rate of Rs.107.5 per US$, the monthly income an individual can obtain is approximately Rs. 134,000. This is revenue that remains in Sri Lanka and it is highly likely that expatriates visiting the country will spend these funds in the country while the government has the benefit of the US$ remittance for investment. Even small amounts should be encouraged. Little drops of water makes a mighty ocean. Small time investors in large numbers may be more valuable than a few big time investors. Educating even the smallest investor is a key factor. Even if they don’t return to live in Sri Lanka, expatriates can be enticed into investing while living overseas if the "Fear Factor" is removed. As things are today, those of us who have toiled hard for decades working in stressful jobs that demand a high standard of service in developed countries would not like to be treated as discards or be dictated to in government only projects when we have the potential to help the country in many ways. The question is does the government want us? The only time expats are thought of is when they need funds for disasters and for donations to projects that are of no benefit to the donor. Investment opportunities with private regulated institutions in Sri Lanka if liberalized will benefit not only the government but also individuals. A lot is said about the domestic and other skilled workers who bring revenue to the country but, they all get roughshod treatment from the minute they land on Sri Lankan soil. The anti expatriate sentiment has to change and greater flexibility provided for naturalized citizens of other countries who are of Sri Lankan descent. Even discounting for inflation, there are people willing to invest if the tax structure is not so unreasonable. Some taxation is understandable but a "punish the foreigners" attitude is not going to win. If the government is really interested, they need to survey the opinion of expatriates through the foreign missions overseas and come up with a plan that is of advantage to the investors as well as the country. Of course, the investors need to have full control of their choice of investment. No individual will be willing to invest in government projects and wait endlessly for a return. Nor is the exorbitant one time US$2000 fee for dual citizenship the answer. Many keep away from dual citizenship and resent giving handouts to the government knowing that it does not go toward any visible development for the country. Why would expats invest $100,000 in a SL rupee account? If at all it has to be NRFC a/c. Current social & political situation is not suitable for even a $10 investment. Bring peace then investment will come. In a country where corrupted politicians are entitled to so many tax free opportunities, why would an expatriate invest even $ 10. There are over 100 cabinet ministers sucking millions of tax-free benefits.. and what is their contribution....?? We are in this situation because in 2004 corrupted politicians ploted to overthrow Ranil's govt. Even the LTTE was involved. Today we, the tax payers, pay for the unwanted war. The expatriates are used to getting everything at a bargain from Sri Lanka; free education, holidays at a bargain, cheap domestic help, etc. An expat will spend close to $2,000 per person for a short visit to Sri Lanka from some parts of the world, yet they complain about paying that amount to get their citizenship back.